Charismatic people are natural leaders who draw their power from stirring admiration and powerful emotions. This article will provide you with traits and examples of charismatic people and provide you an how to guide on how to become more charismatic. Should You Try to Be Charismatic? Charisma is a presence that excites us. Charismatic people have something that most people don’t have. Something we don’t have and we wish we had. We look up to them and we can’t resist but idolizing them. It’s that looking up to the them that gives charismatic men a strong social power. Most people would gain from learning to be more charismatic. Many traits of the charismatic men are indeed high quality trait that will make you an overall better person. Confidence, conviction, a vision and a WHY in life for example are all helpful traits across the board. And eloquence, the ability to change people’s states and influencing are also very useful skills to possess. As for many things in life, moderation is key. It comes a point where too much charisma turns on its head to become a liability. The certitude of the charismatic man for example can come back to bite you in the buttocks when someone finds out you don’t know what you’re talking about. And if you go too far with soap boxing, it can get tiring for people. Also, if you want to be charismatic to acquire political power, you should also be aware that power only based on charisma tend to be short lived (more on it later). Sometimes “over the top” is mistaken for charisma. But that’s the type of weaker charisma. Charisma based on simple state changes is a helpful skill to have. But if is only based on changing people’s emotional state, then it’s the most short lived type of charisma. And it vanes away in a matter of minutes. Screaming trying to whipping people up in a frenzy instead is not charisma at all. Have a plan you believe in, know where you’re going and people will instinctively want to follow you. Where you’re going matter less than having a strong cause, an ideal or a vision you communicate passionately of. Most people pay lip service to high values. And then go about their own life because, well… That’s life. The few who actually honor their values no matter what impose their bigger than life presence on the people around. And we look up to them. By putting values and tradition above the baseness of money, The Godfather shows the trait of charismatic saintliness. Most people compromise, change their mind, say one thing and do another, show a face in public and another in private. It’s part of life, part of keeping an even keel and staying afloat. We come to accept it as simply how it is. But deep down we admire the people who go on the extreme -and stay there no matter what-. They have guts, we think. And especially in times of uncertainty and turmoil extremists gather a strong crowd of followers. 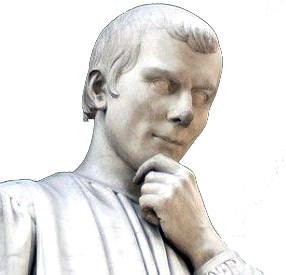 Girolamo Savonarola, in the picture, was a dangerously charismatic extremist. 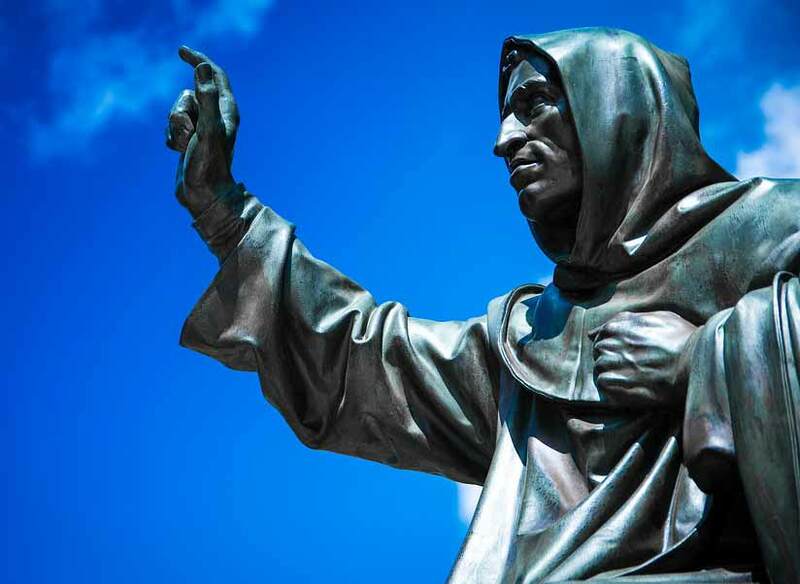 With religious fervor and uncompromising puritanical zeal he set out to undo years of enlightened conquests in Florence and pull the world back into medieval ages. He lacked the social skills to understand when to stop. But he did manage to stir much discontent and to burn and destroy much art before he got burned himself (very dark pun there). Charismatic leaders are masters in using the demonic power of words to elevate, incite, stir anger or to simply beat their opponents into (verbal) submission. Eloquence is nice, but by itself it’s just words. Eloquence by itself make you an academic. Eloquence with passion, purpose and direction makes you a charismatic leader instead. Most people are constantly in doubt. They don’t know if they’ll manage, they don’t know what they will do with their life… And they don’t know what they will do later today. The charismatic has an air of eternal confidence and certitude. And it’s frankly difficult not to be swept away by the mixture of passion and conviction of some of the most charismatic men in history. Sometimes they appeal to nothing concrete. They call up in arms for honor, “empires”, values… And even peace (!). But they say it so convincingly passionately that, deep down, we all admire them and want to be on their side. Benito Mussolini: The keyword is one and one only. Winning. And we will win. I may be wrong, but I’m never in doubt. Note: charismatic people will be charismatic when speaking with conviction even when they talk smack. However, that cannot last long. If people get to know you well and you keep talking nonsense, your charisma will quickly fade over time. Pavid, fearful men are not charismatic. How can you trust anyone if they withdraw when they’re needed the most? When the chips must fall on the table, you must show your strength and resolve to make things happen. People admire and follow those who are in charge. And as Machiavelli said, being feared is better than being loved. Which is especially true in moments of crisis. A step above and beyond muscular leadership is showing fearlessness in the face of danger. We all fall conventions, afraid of being judged and ridiculed. Not the most charismatic men among us. They are who they are and go for what they want without caring about what everyone else thinks. We all put on a mask in public. We try to hide our emotions, to show ourselves stronger, smarter and better than we really think we are. So when someone can show himself (figuratively) naked in front of an audience it impresses us all. Dropping the mask is a sign of strength (read Mask of Masculinity), but it’s also a sign that we are possibly more emotional than rational. And again, it’s emotions that appeal us the strongest. Some of the most charismatic characters show a daredevil side, a rebellious streak. They live life their own way, sometimes even going against the grain of society. LOL, so typical Hollywood :). But it shows the adventurous spirit combating against “the timid bore of numbers and rationality”. History is peppered of charismatic men. Most dictators are charismatic men. They often take the helm of nations by riding the waves of discontent, rebellion or strong emotions. They sometimes make up enemies so they can whip the crowd into a frenzy by pointing their fingers at something else. They will ride that growing wave and as everyone is taken over by emotions, very few will realize how poorly equipped they are to actually lead a country. For Hitler the enemies were jews, for Lenin it was the rich capitalists oppressing the poor. Robert Greene in The Art of Seduction uses the chilling example of Robespierre’s own death as an example of the dangers of extreme charisma in the political arena. Robespierre rode a wave of highly emotional rebellion that turned nasty with the rein of terror. Eventually Robespierre kept the heat of the terror on for way too long when the population wanted to go back to normal life. And in a few months he went from revered charismatic leader to everyone turning against him. Charisma is indeed as volatile as the emotions it creates, says Greene. The charismatic often wins love and support by barging into a difficult scene as the savior. He provides a strong guidance and helps everyone right through the turmoil. But once the people start feeling more secure or feel the times are changing, charisma is less needed and the charismatic man a thing of the past. Some charismatic will try to keep the flames of danger and risk ablaze just to stay in power. Or because they don’t know any better or what else they can do. But people will tire of it and at the first sign of weakness will turn on you. Robert Greene says you should then turn the heat lower when the adventure is over and slowly settle into a more boring routine. People will admire your self control and adaptability if done correctly. The alternative is having an army to prop yourself in power, which you will need as charismatics tend to make quite a few enemies. Once the dust settles charismatics leaders and rulers tend to leave a mess behind with their wild personalities. The one who follows after a charismatic is left with a big clean up to do. Most people fail to understand how the mess was created in the first place though. They miss the charismatic leader and blame the successor for the problems. To avoid this situation Robert Greene suggests instead going in a completely new direction. In the 48 Laws of Power he explains how Truman escaped that way the charismatic curse of Theodore Roosvelt. George Bush: I don’t know a thing about the German healthcare system. Instead of listening, pretending of knowing or agreeing, Bush admits he doesn’t know. And implies he doesn’t care. He’s got other priorities, we imagine, and couldn’t care less about German healthcare system. Very charismatic in a slightly asshol-ish way. Follow the above, and you’re on your way to be a damn charismatic (wo)man. While to be charming it’s imperative that you are socially skilled, people’s skills is not a necessary requirement to be charismatic. Indeed a charismatic man might also draw more power from being asocial. That communicates that you are all too consumed about your art, passion or mission to even care about people. However, social skills and understanding of social dynamic is what would ultimately allow you to stay in power (or to stay popular). If Robespierre and Rasputin had been more socially skilled for example they would have seen the writing on the wall and adapted their strategies. Charismatic man are natural born leaders. People look up to the them because they possess strong qualities and convictions that they wished they had themselves. In this article we saw the traits of charisma, the dangers of charisma and how to be charismatic without any downside.